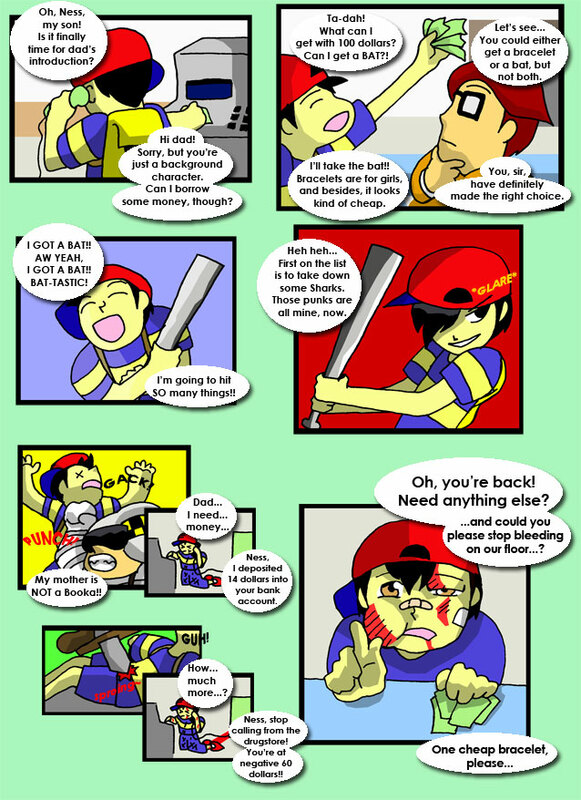 Starman Junior falls and, much to our dismay, steals an entire page of backstory. What a cad. The battle rages on! Ness, Picky, and Buzz Buzz go all out, but Starman Junior just won't quit. This page, again, was meant to be 2 pages but I didn't want to devote an entire page to the "attack" panel. Not the brightest of ideas, so the paneling may be a bit confusing on this one. It reads like this: 1(Ness/Starman), 2(Picky/Pokey), 3(Picky), 4(Starman), 5(Buzz/Ness/Starman), 6(Buzz), 7(Ness/Picky), 8(Ness/Picky/Buzz), 9(Starman), 10(Ness/Buzz), and then the four connected across the bottom. ...Yeah, sorry.